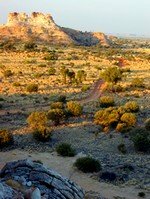 This Australian Outback travel guide is written by a real person, who has a very real life here out back. You will see that the Australian Outback is not all desert (with one big rock and a few kangaroos...), far from it. And it's not as dangerous as they make you believe. Learn about our snakes, discover the myths about our spiders, and find out how to stay alive amongst our crocodiles. Learn about the issues surrounding the Ayers Rock climb, how to avoid the tourist crowds in Kakadu, hike through Kings Canyon and explore Katherine Gorge in a canoe. Find a cheap flight and some jet lag remedies, a cheap hotel or a free camp site, and if you are young and adventurous, I can even show you the easiest way to get a Working Holiday Visa for Australia AND to find a job. And that's just a start. Whether you are dreaming about or planning a trip to Outback Australia, you will find some real help here and—where needed—the inspiration to finally make your dreams come true! What happened then was that I fell hopelessly in love with the Outback, and stayed. I created the Outback Australia Travel Guide to show you why, and to help you with the preparation for your own trip. The Australian Outback is more beautiful than you ever imagined, to travel here gives you a sense of space and freedom you never thought possible, and it is nowhere near as dangerous as they try to make you believe. All you need is enough information, and a reasonable measure of common sense. I like to think that I can offer you plenty of both, so lets get started. The Travel In Australia section tells you about the different ways to get here and to get around Australia. From cheap Australia flights to preventing jet lag, from the Ghan train to outback driving tips to hitchhiking, it's covered here. Under Visas for Australia you find information regarding the different visa classes, where and how to get them, what you can and can't do with a visitor visa or a work visa for Australia etc. 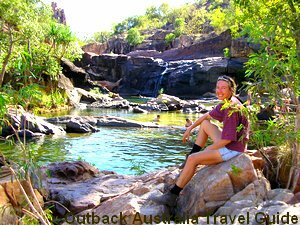 Then there is an area that has background information about the Australian Outback as well as travel information, specifically for outback travellers. And last but not least there is the real heart of the site: hundreds of pages that cover different destinations in the Australian Outback (outback towns, Australian tourist attractions, Australian national parks). Now, I realise that this is all a bit overwhelming, and that's why I have created a FREE Outback Travel Guidebook to get you started. It tells you everything you need to know to plan a trip in the Australian Outback. You can get access to it by subscribing to this site (for free of course) through the box below. It's my thank you for your interest in my site and in the beautiful part of the world that I live in. Subscribe for free and get a FREE 70 page Outback Guide! If you like this website and guide, help others to find out about it. If you have a blog or website, or know someone who does, please consider linking to me. Share the link on Facebook, Tweet it... you get the idea. Every link helps! I hope I will make Outback Australia come alive in your imagination, and when you visit I hope you will love it as much as I do. This site uses British English, because that's what Australians use.